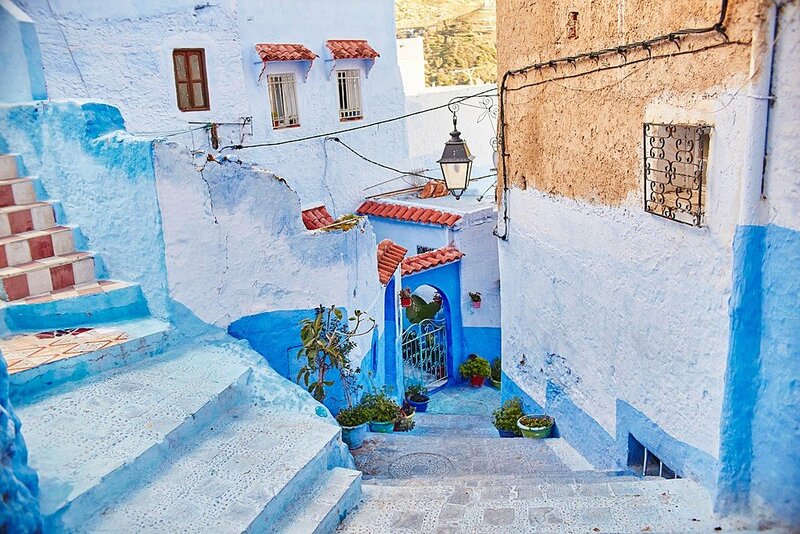 You probably know it from Instagram: the blue-washed streets of Chefchaouen are irresistibly photogenic. 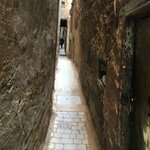 But nothing can compare to wandering through this hillside town on your own, discovering a medina cast in shades of azure and aquamarine. 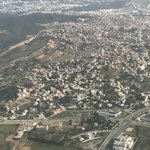 Use this handy overview to explore this northern Moroccan city. Chefchaouen means "two horns"—a reference to the twin peaks that tower over this small hillside town in northern Morocco. Locals call it Chaouen, but many travelers know it affectionately as "The Blue City." And rest assured that foreigners have discovered the place. 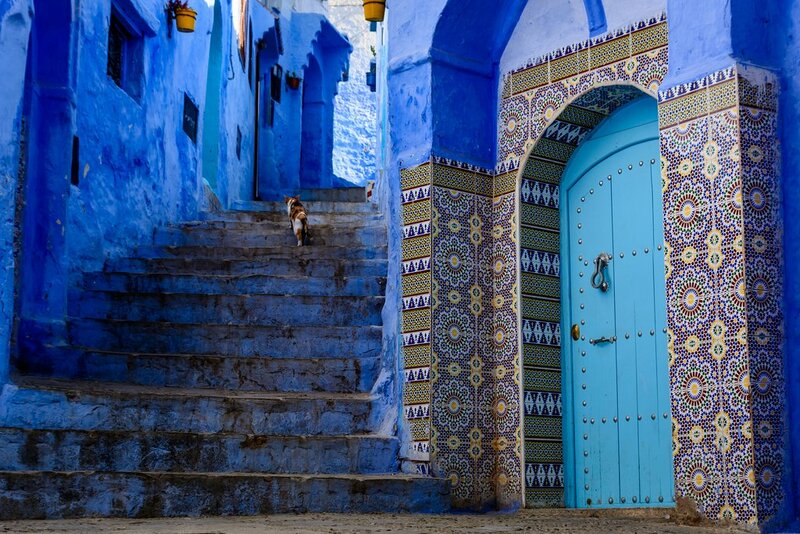 Chefchaouen has seen a spike in tourism in recent years, thanks, at least in part, to the dreamy images shared by travelers on social media. And yet the town retains a laid-back authenticity. Maybe it's the surrounding landscape, or maybe it's the calming blue tones, but the atmosphere in Chefchaouen feels more relaxed than what you'll likely experience in Marrakech or Fes. The region has always been sacred to Muslims due to the presence of the tomb of Moulay Abdessalam Ben Mchich, patron saint of the Jebali Riffian tribesmen. In the late 15th century, the region experienced an influx of Muslim and Jewish refugees from Spain. And until the recent wave of tourism, Chefchaouen has been mostly untouched and isolated. Use the following overview to seize the day—and get some great photos while you're at it—in this fascinating destination. Chefchaouen is small: two days is enough to see the main attractions. However, many people come here to relax in one of the hammams or hike in the nearby mountains, so you may want to allow yourself some extra days. For more information on how much time to spend in this region and other parts of Morocco, check out this article. You'll spend most of your time in the compact medina. You could easily spend half a day wandering the alleyways, taking photos of brightly colored pots juxtaposed with the blue walls. But there are some key sights worth seeking out. At the bottom of the medina is the Plaza Outa el Hammam, the main square, which is named for the number of hammams that used to circle it. Here, you'll find a range of restaurants and cafés perfect for people-watching. After a cup or two of mint tea, venture to nearby leather, carpentry, and textile shops. 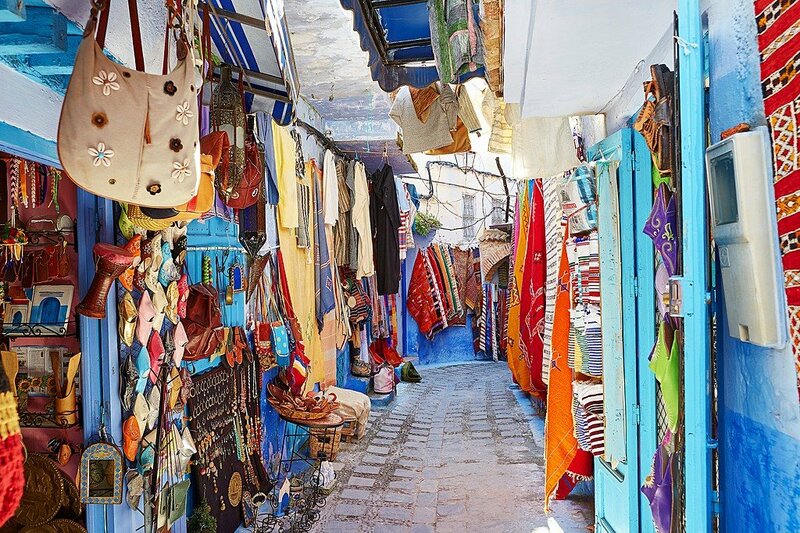 Many travelers say they prefer the experience of shopping here, in contrast with Fes or Marrakech: the prices are generally a bit better and shopkeepers are more relaxed. One shopping experience not to be missed is a visit to Hat Man. At this funky emporium located toward the top of the medina on Rue Targui, you can buy hand-knitted hats in many shapes, sizes, and colors. For gourmet souvenirs like goat butter and local mountain honey, head to Plaza Hata, then admire colonial architecture in elegant Plaza el Makhzen. After a lunch of tagine (a North African stew made with stewed meat and vegetables) at one of the town's various traditional eateries, head to the Grand Mosque and Kasbah. The Grand Mosque, built by Moulay Mohamed in 1560, is the city's oldest and largest place of worship. Like all Moroccan religious sights, non-Muslims are not allowed to enter. However, it's still a building worth admiring from the outside. At the kasbah (old fortification), you can visit a garden, a museum, and some of the old prison cells used during Spanish rule. Make sure you head to the roof for a fantastic view of the boldly-hued buildings and town below. Next, head over to Ras el Ma spring, the town's primary water source, and find a quaint riverside café where you can pause to enjoy another cup of tea. You may even catch a glimpse of local women washing their clothes in the water. Then, follow the path up the hill for half an hour to reach the white Spanish Mosque. From this vantage point, you can savor one last view over the town as the sun sets behind the mountains. On your second day, take a short drive to the starting point of a hiking trail. You can choose between hiking along the river to the Cascades d'Akchou waterfall, or to the rock arch known as “The Bridge of God.” If you're feeling energetic, you could do both. Otherwise, plan on spending at least a half day on the journey to either destination. Chefchaouen is a scenic drive from Fes or Tangier. Set in the Rif Mountains, the blue and red-tiled rooftops emerge like a mirage as you approach the town. Expect a four hour ride from Fes, and a little over 2 hours from Tangier. If you're traveling from Fes, consider a short detour to the impressive Roman ruins at Volubilis, once at the far stretches of the vast Roman empire. Plan a trip during spring (from March to May), when you'll have a good chance of seeing wildflowers on the drive in or out of town. If not, the months from September to November are also a solid choice. Either of these shoulder seasons is optimal for travelers, as you can typically avoid crowds and save on accommodation. This article on the best times to visit Morocco is a helpful resource. With an ideal location inside the medina, the opulent Lina Ryad and Spa has spacious rooms and terraces with views of the mountains. The hotel is beautifully decorated with arches, fireplaces, Moroccan textiles, and bright pops of blue throughout. After a day of hiking, the heated indoor pool, baths, and hammam are the perfect place to relax. A few of Chefchaouen's hotels house the best restaurants in the city. One of those is a medina classic, Casa Hassan. Choose from eight brightly colored rooms here, or 14 more at their sister hotel, Dar Baibou. Many rooms come with a working fireplace; all are outfitted with unique tiles. Head downstairs to enjoy a traditional Moroccan lunch or dinner at the Tissemlal Restaurant, featuring grilled meats, couscous, and tajine cooked over an open fire. 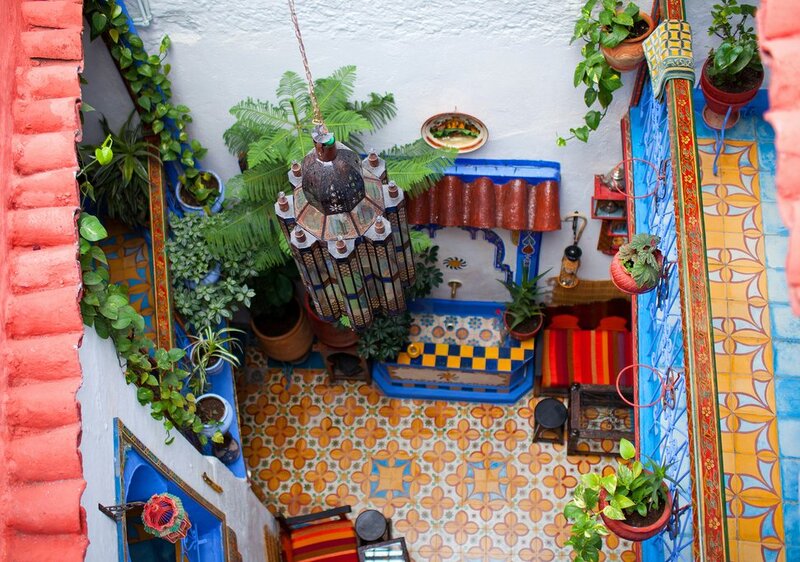 Casa Perleta is a top-rated riad in the medina. A traditional Andalusian house restored with local art and tapestries, it has eight rooms. Linger over a traditional Moroccan breakfast of fresh bread, homemade jams, and fresh fruit on the rooftop terrace with views of the medina below. One of the most famous restaurants in town is Casa Aladdin, with unparalleled views over the Place Uta el-Hammam. 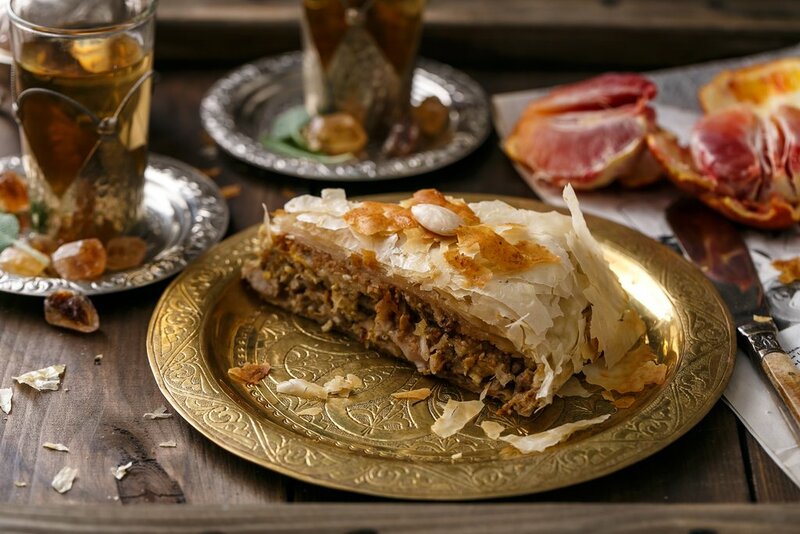 The house specialty is a wonderful vegetarian bastilla (also known as pastilla, a traditional Moroccan dish that's best described as a savory pie). Another dish to try is the anchovy tajine, a northern specialty. Popular Lala Mesouda is known for homemade Moroccan cuisine, including exquisitely prepared tajines and excellent couscous. Some of their most famous dishes include local recipes like baqula (a salad of cooked greens), chardon (artichoke thistle cooked in olive oil), and sfarjel (a mix of quince and beef). For a quick bite, go to Restaurant Populaire and grab a bocadillo (Spanish sandwich) from the favorite local sandwich joint. Try the “Tangier”—a mouthwatering, slow-cooked strip of tender beef seasoned with garlic, onion, and cumin covered in a tangy yogurt sauce. Keep in mind that people live in this postcard of a city. Be respectful when taking pictures of homes and posing on doorsteps. Wander the streets early before breakfast and you may have the place to yourself before the day travelers arrive. If you plan on hiking, make sure you bring a bathing suit and trekking shoes that you don't mind getting wet. The natural pools up in the mountains are great for a quick dip when the weather's warm. 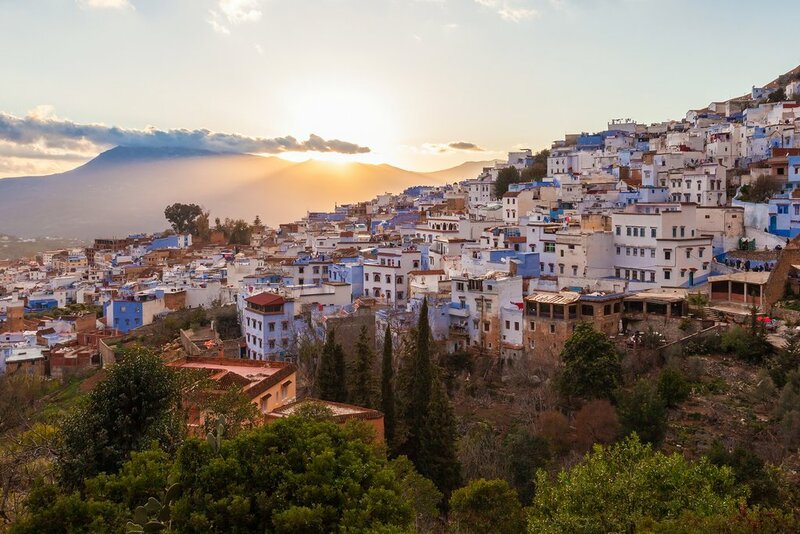 For the best view of Chefchaouen, hike up the hillside, past the city gates to the Hotel Atlas, where you'll find unbelievable panoramic views over the blue city. Read this article on Morocco's top highlights for further travel inspiration and advice.